Product information "HAIX Fire Hunter Xtreme"
As a firefighter, you see a lot of heat. In fact, that is what you battle every day, all day when you go into the scene of a fire. You want your work gear to be strong and sturdy, yet comfortable. Finally, there is are waterproof steel toe boots that deliver everything you expect in HAIX fire boot performance and comfort. Certified by UL to NFPA for structural firefighting, the HAIX® Fire Hunter Xtreme waterproof steel toe boots are for you. The HAIX® Fire Hunter Xtreme bunker boot has got your back when the alarm goes off - bringing you a reliable and protective waterproof steel toe boot which allows you to move no matter what your gear or how rough the ground is. Firefighting is tough and dirty, and this boot is designed for the challenge. The HAIX® Fire Hunter Xtreme boot is made in Europe of quality leather and HAIX® proprietary innovations. Firefighters love it. On the outside, it is made of water resistant, sun reflecting leather. This helps keep the waterproof steel toe boot looking new for a long time as well as deflecting additional heat from a hot day before it can penetrate the boot and make you uncomfortable. The rubber contains nitrile, a compound resistant to heat, fuel, and oil. Firefighting is not a nine to five job, and neither are these Haix fire boots. The HAIX® climate system helps keep your feet comfortable for long hours at a time. The ankle flex system helps keep your ankle stable and straight, while offering enough movement to kneel, crouch, or operate equipment. The high durability, rubber toe cap helps to protect your boot from abrasions when you find it necessary to crawl into those tight spaces. With a self-cleaning rubber outsole, the boot also provides heat resistance and electrical hazard grounding. It is oil, fuel, and slip resistant. On the inside, pure comfort and quality with a steel toe cap and steel mid sole to offer toe and puncture protection, with a TEXON fleece foot bed that supports your feet and absorbs moisture. The moisture wicking insole further ensures your feet stay dry and cool. The CROSSTECH® inner lining is waterproof, breathable, and offers protection against chemicals and blood borne pathogens. The Secura Liner® is an inner lining which is built to stay in your boot rather than wrinkle or pull out as you remove your foot. The leather heel counter molds to your heel like a second skin for maximum, blister-free comfort. Finally, you have the MSL system, a PU foam cushioning injected into the sole, which is shock absorbent and insulating from the extremes in temperature you can encounter on the job. 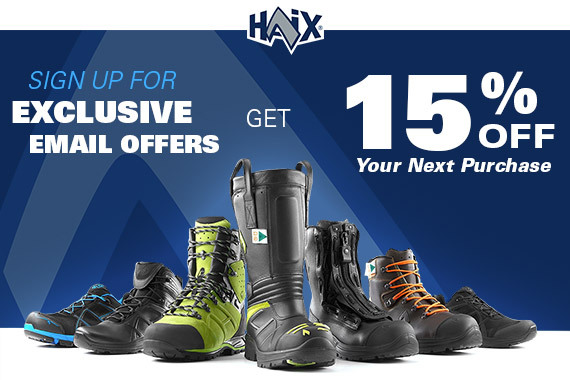 As the owner of HAIX® Fire Hunter Xtreme footwear, you can have your footwear refurbished with original materials and parts when you get an extended wear package, after your original warranty has expired. The extended wear package gives you the comfort and security of the repair or replacement of rubber toe caps, stitching, sole retreading, and insoles. Your footwear will also be cleaned and deodorized so that it comes back to you almost new once more. The upper material of the HAIX® Fire Hunter Xtreme is made of smooth leather with a recessed handle at the top on each side to make it easy to pull the boots on in a hurry. Combined with the inner lining, the HAIX® Fire Hunter Xtreme also gives extra protection against chemicals and blood borne pathogens. The leather is a HAIX® Sun Reflect specialty leather to keep your feet cool, even in direct sunlight. The HAIX® AF Ankle Flex system gives your ankles the support they need but also the flexibility to kneel, operate equipment, and bend as needed. The exterior rubber toe cap (profiled) gives the boot extra abrasion resistance. With the Secura Liner® you can be assured that your liner will stay in place rather than wrinkling or pulling out. HAIX® Climate System helps your feet stay dry and cool even when your surroundings are hot. A Ladder shank has been added to give more support when having to stand on ladder rungs. Your toes are safely protected via the steel protective toe cap. Padded shin protection ensures that your feet and legs suffer as little damage as possible during the workday. For protection against nails and other sharps, HAIX® Fire Hunter Xtreme comes with steel puncture protective soles. The CROSSTECH® material makes the boot both breathable and waterproof. HAIX® MSL (Micro soft light) PU foam is throughout the sole of the boot; the PU material is injected throughout the sole to give it optimal shock absorption and insulation from hot and cold temperature extremes. The slip resistant and highly heat resistant rubber sole will keep you on your feet when duty calls. Related links to "HAIX Fire Hunter Xtreme"
Customer reviews for "HAIX Fire Hunter Xtreme"
I am a volunteer firefighter and i love these boots!!! they are a little tight at first but once they break in the most comfortable boot i have worn and i just bought a second pair for wildland fire. I bought these boots (factory Seconds) & put them in service Aug 2013. I work in the oilfield as a Equipment operator for Baker Hughes Inc. I wear them 12 to 20 hours a day 6 days a week. I work in mud & water ankle deep at times. also exposure to mineral spirits, Hydrochloric Acid & other chemicals from time to time. They haven't leaked yet & are as comfortable as the day I got them. I used to get the Worx boot by Red Wing for $160 to $180 & could only get 6 months out of them because the waterproof liner would wear out in the heel. these have a superior design with a strip of leather in the heel to prevent that type of wear. They're easy to clean & the toe cap is very durable also unlike other leather boots ive seen . i'm about to buy a second pair so when I need repair i won't be without them. Love them Love them Love them. I love these boots. I first bought a pair of Airpower Rl station boots and fell in love with how comfortable they are. After that shift I Went out and bought a pair of the Fire Hunter Extreme Structure boots as well. Thanks for making a comfortable boot. you found a loyal customer for life. I have been a faithful HAIX wearer since 2003, starting with the FIRE HUNTER structural boot. I am currently wearing my second pair of US RESCUE at my factory job. These are the most comfortable safety toe boots that I have ever worn. They are light weight and require virtually NO break in period. I also own a pair of the KENTUCKY that I wear for casual dress. Hopefully someday HAIX will release a gym shoe line, and my shoe shopping could all be done through HAIX.